Wales equal their record: It mightn’t have been pretty but Warren Gatland’s men managed to equal their record streak of 11 successive Test wins on Saturday. Number 11 came against Italy at the Stadio Olimpico as a second-string side got the job done, putting Wales are in a decent place going into the Six Nations break. When they return it’s a home game against England as this side looks to go out on their own on 12. England’s kicking game: Last week and this, they’ve dominated the kicking battle and it has paid significant dividends, particularly on Sunday. With France selecting a back three who were all playing out of position, the hosts peppered them throughout. Damian Penaud and Yoann Huget were consistently targeted and they failed to rise up to the challenge as England took advantage of their inability to read or position themselves correctly. In comparison, the Red Rose had wings in Jonny May, Chris Ashton and Jack Nowell who have developed and honed their skills over several years, and it showed. Northampton comeback: Trailing 28-7 was no problem for Saints as they fought their way back to eventually run out comfortable 59-33 winners over Newcastle Falcons on Saturday. This 14-try thriller at Franklin’s Gardens saw Northampton book themselves a Premiership Cup Final date with Saracens, who beat Worcester on Friday, in what should be a fascinating contest on March 17. Play like this and Northampton could grab some silverware at the first opportunity under new head coach Chris Boyd, who is starting to see the fruits for his early work at the club. Brazil: We saw their scrum recently demolish the Maori All Blacks and that proved no fluke as on Saturday their pack was at it again, this time against Canada in the Americas Rugby Championship. Built on that impressive set-piece the Brazilians won 18-10 in Sao Jose dos Campos, bouncing back from last week’s hiding at the hands of Argentina XV. They’ll hope to build on this win when taking on USA later this month. Great business from Leicester Tigers: This could prove the signing of next season as Leicester announced that flanker Jordan Taufua will be joining them later this year. The Crusaders back-row is such a workhorse and honest forward, who will quickly endear himself to the Welford Road faithful and we expect him to become one of the Premiership’s stand-out players in 2020 and beyond. Taufua is unfortunate not to have won any caps for the All Blacks but he has not given up hope of gaining a Rugby World Cup call-up. We doubt that will happen due to others staying in New Zealand likely to get preference but the All Blacks’ loss is definitely set to be Leicester’s and the Premiership’s gain. 🗣️ “I see a lot of similarities between the Tigers and the Crusaders, and I am fully bought in to the vision that Geordan Murphy and his staff have for this team." 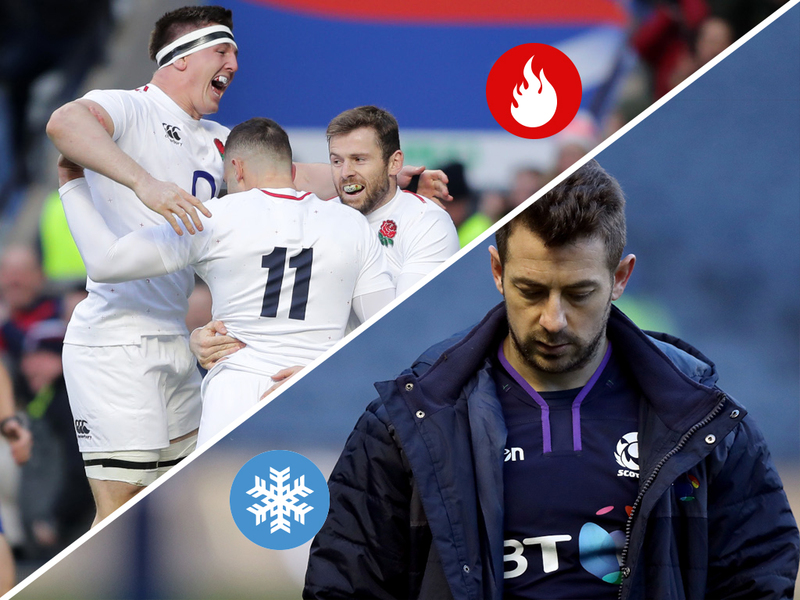 Greig Laidlaw’s post-match comments: It was poor of the Scotland skipper to air his grievances as he did, particularly when Romain Poite didn’t have a poor game. The captain said, among other things: “Romain refereed us against South Africa [in November] and we don’t seem to see eye to eye.” There are always individual decisions which will frustrate both sets of supporters but the one that particularly irked Laidlaw was incredibly minor in the context of the game. Scottish fans, and Stuart Hogg himself, was upset by the hit from Ireland’s Peter O’Mahony which took the full-back out of the game but, as unfortunate as it was, you can understand why it wasn’t a penalty. Ultimately, Poite wasn’t responsible for Tommy Seymour gifting Ireland a try, he wasn’t responsible for the numerous errors made by the hosts and he wasn’t responsible for them failing to really turn up in the second half. Jacques Brunel: What are you doing Jacques? The initial squad was unbalanced anyway, with only one natural winger in the 31-man group, but to then shift him to full-back and have two centres on the wing was nonsensical. It was a nightmare for all of Damian Penaud, Yoann Huget and Gael Fickou, who were consistently exposed by England. What made it worse was that the changes only came after half-time when all could see that it needed to be altered 20 minutes in. There was also no discernible game plan and, as a result, questions will inevitably be asked of the head coach and his assistants. Canada: While their North American brothers, the USA, are beginning to thrive, it is not such a good story for Canadian rugby, which continues to struggle. They were once much the stronger of the two but have since been overtaken by Gary Gold’s men. Although Canada may have qualified for the World Cup in Japan and had a number of first team players missing over the past two weeks, it is still concerning that they succumbed to both Uruguay and Brazil. Head coach Kingsley Jones, and his bosses, must be concerned heading into the global tournament. Steve Hansen’s “Mickey Mouse” comment: Hansen was reportedly furious that his comments made at a fundraiser were revealed publicly, and to an extent he has a point, but former Wallaby Drew Mitchell was spot on in his assessment. The ex-wing said: “It’s disappointing to think perhaps that a boozy lunch, where he thinks things will be kept in house, that that may be their true opinion. When everyone’s watching he’ll say what everyone wants to hear, but when it’s behind closed doors in an environment where they think no quotes will be taken, then it comes out.” If you didn’t know, Mitchell was responding to Hansen’s comment saying: “They’ve got Mickey Mouse coaching Aussie,” which is poor when New Zealand regularly talks about culture and respecting the opposition. "They've got Mickey Mouse coaching Aussie." Stephen Larkham and Michael Cheika: And no, it doesn’t refer to the above section, with Australia embroiled in their own controversy. Just a few months out from the World Cup, Stephen Larkham has been sacked as the Wallabies’ attack coach due to not seeing eye-to-eye with Cheika. They had “differences in attacking strategy and overall game philosophy,” according to the legendary fly-half, but it poses a number of questions, with the main one being: why has it taken four years for this to become a real problem? Surely this would be apparent immediately? Larkham was actually headhunted by Cheika after being impressed by the ex-pivot’s work in Super Rugby but his position eventually become untenable. Who knows, it may well benefit Australia, but the problems are deeper-rooted than that. Wallabies on the hunt for a new attack coach eight months out from Rugby World Cup after Stephen Larkham is sacked, @ChristypDoran reports.